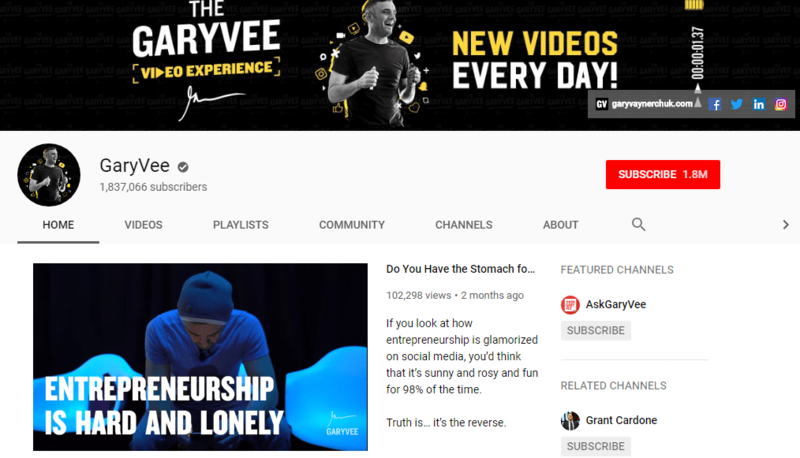 If you are an entrepreneur or want to be an entrepreneur, then you should follow these youtube channels which will definitely add tons of extra values. There are lots of people creating the best content on youtube on entrepreneurship-related niches. But as we know that every people have their own point of view and have a different way of thinking and implementation. So it will create a lot of confusion for us regarding whom to listen or who to follow. Don’t worry about it, I am here to help you. If you want to run your business successfully then you don’t have to stop learning. Even Bill Gates used to spend most of the time reading productive books. While books are a great source of inspiration and knowledge but nowadays people are more connecting day by day digitally. 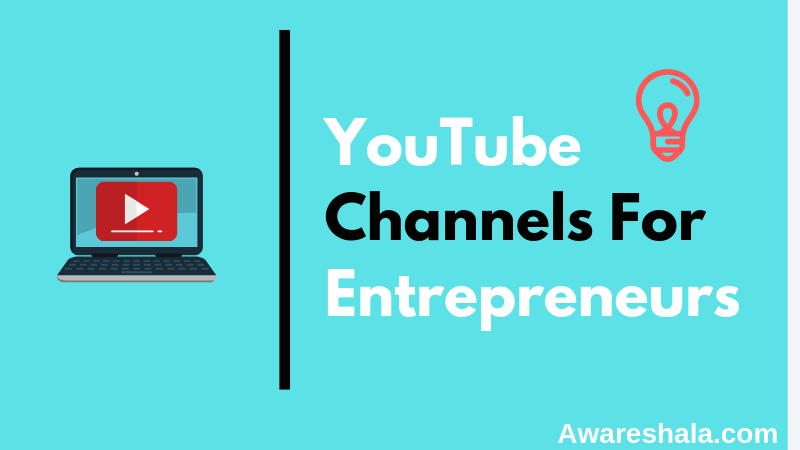 Therefore, providing you with the best youtube channels for entrepreneurs to Follow in 2019. 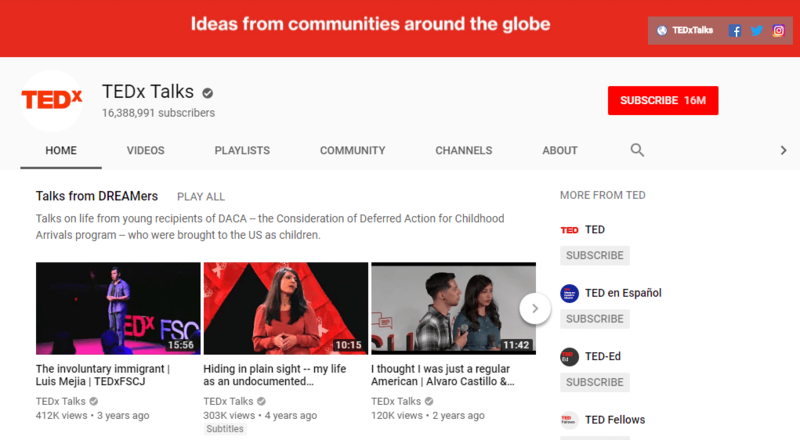 TED abbreviated as (Technology, Entertainment, Design) founded in 1984 is a media organization which posts talks including scientific, cultural, and academics topics online for free distribution. It is providing free online talks on their website and two youtube channels namely TEDx and TEDx Talks. This community which organize events everywhere – celebrating the locally-driven ideas and producing them in front of the whole world. TEDx events can be organized by anyone who has a free license from TED. Moreover, this youtube channel is a treasure for the field of aspects including entrepreneurship, success stories, productivity, knowledgeable talks. Instead of inspirational videos, you also come along how to speak and storytelling in a good manner by watching the TEDx speakers. HubSpot is an advertiser and developer of programming items for inbound showcasing and sales/deals. Founded by Brian Halligan and Dharmesh Shah at MIT in 2006. Their products are to provide services to different customers like SEO, social marketing etc. And joined youtube in 2007. At the initial stage, they used to publish the success stories and a keynote presentation to target the audience related to inbound marketing strategies. But in recent years this channels becomes a great source of inbound bold talks, educational, entrepreneurship and related hubs. I found this inbound bold talks more useful. Although you can find email marketing strategies, the latest innovative technologies related videos. Instead of these, You can also get plenty of videos related to success stories at this stage too. 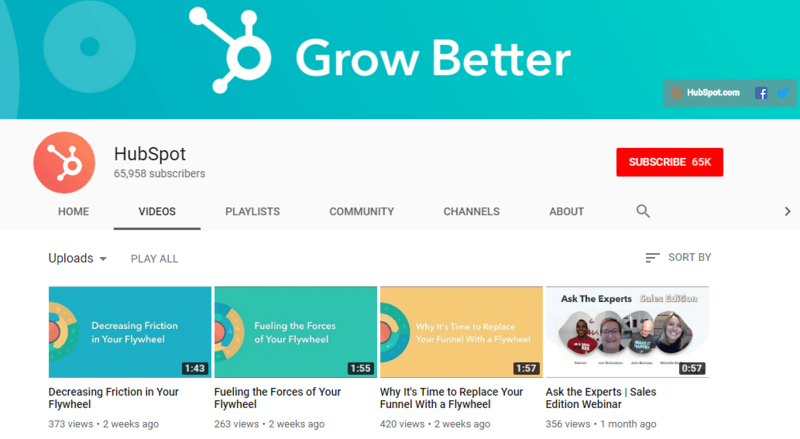 A channel with more than 65k subscribers, Hubspot is the best youtube channels for entrepreneurs, the blogger, a businessman should follow. Garyvee is the founder of VaynerX, a media and communications company and also CEO of VaynerMedia, which is an advertising company servicing at 4 locations in the globe. He is also best marketing experts who wrote a book which is NYT best-selling books Jab, Jab, Jab, Right Hook: How to Tell Your Story in a Noisy Social World having a huge fan following on Twitter, Instagram and if you haven’t followed him then do subscribe his youtube channel to get started. The best part of following him is that he used to upload a fresh video every day. His videos include interviews, QnA, documentaries, keynote speeches. 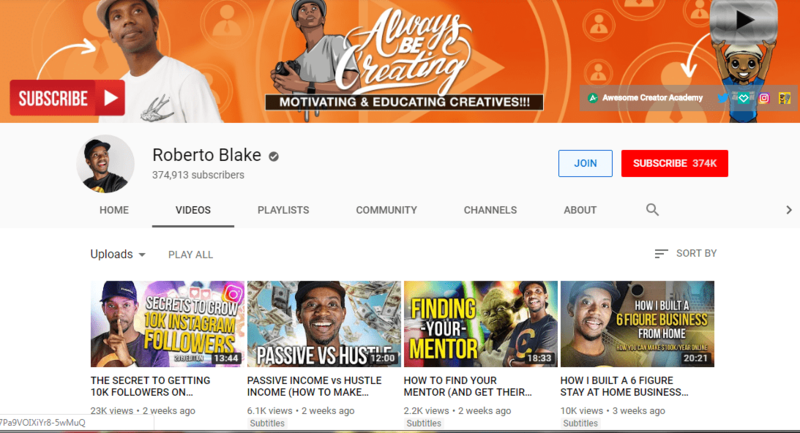 You will be going to get the huge advantage of following him because he used to make videos on the growth, analyze and talks about brands. His youtube channel is having 1.8 Million + subscribers and still counting. It is among the best youtube channels for entrepreneurs. He is an entrepreneur, philanthropist and early-stage startups, investor an author of NYT best-selling business book of The 4-Hour Workweek and The 4-Hour Body. The 4-Hour Workweek basically targets the 9-5 job the people used to do. You must read it. It’s quite a worthful book. His youtube channel is a great source of videos related to entrepreneurship, business advice, and interviews. 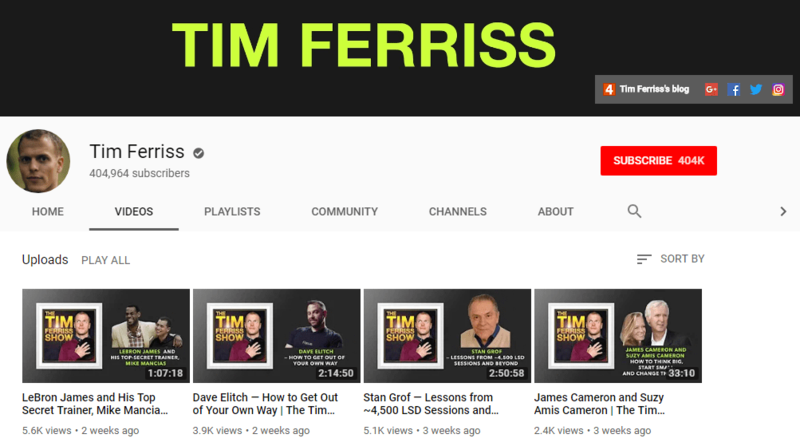 Tim Ferriss youtube channel has more than 405k+ subscribers and still counting. This is also one of the best youtube channels for entrepreneurs to Follow. Because this channel contains plenty of videos related to entrepreneurship and business advice. Subscribe it from here. 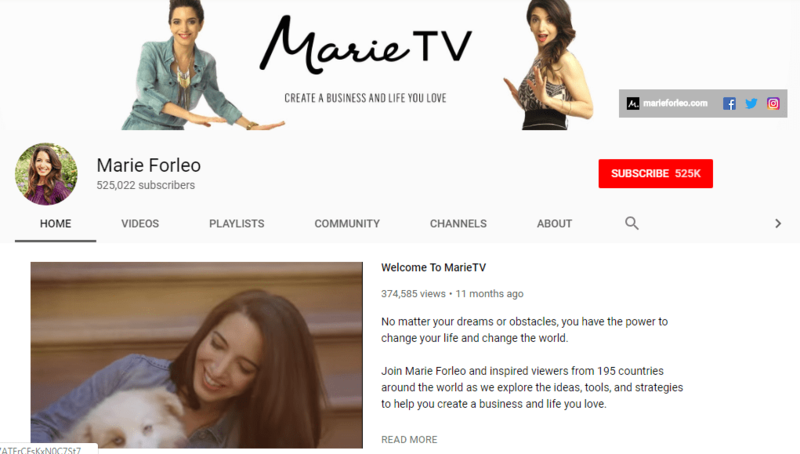 Marie Forleo is a life coach, motivational speaker, and an author Make Every Man Want You. She founded a company which focuses on small business and personal development training for entrepreneurs. Her youtube channel is a treasure for entrepreneurs because this channel provides videos on inspiring interviews, business advice, personality development, productivity, smart advice etc. So every entrepreneur should follow her youtube channel. She is having 523k + subscribers. You will love watching her videos. Brian Tracy is one of the most listened to personal and business success in the world. 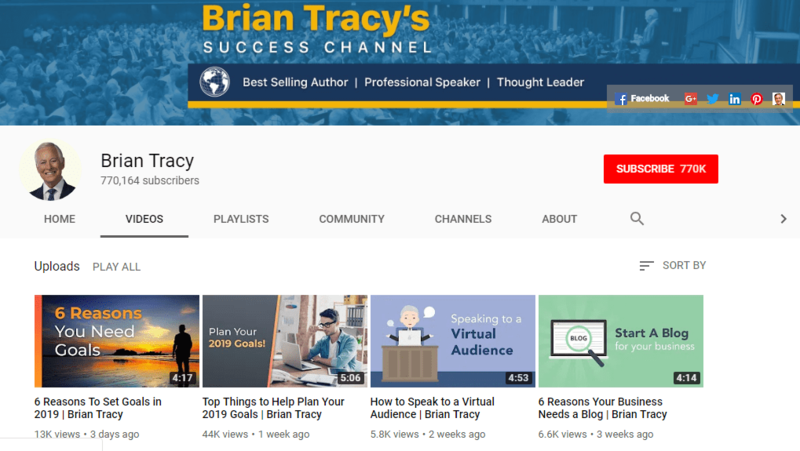 His talks and seminars on leadership qualities, sales management, and business strategies are powerful tools you will going to receive when you follow him on youtube. This youtube channel has more than 764k+ subscribers are started his channel in 2007. Subscribe it from here. He is one of the most experienced Youtuber and having deep knowledge do it the best youtube channels for entrepreneurs to Follow. Tony Robbins is an American author, entrepreneur, philanthropist, and life coach. He is a business strategist and founder of several companies and earns approx $5 billion annually by selling its products. His youtube channels is a great source of inspirational talks, business strategists advice and related to life hacks. Subscribe it from here. He is an awesome speaker. This is why it is also among the best youtube channels for entrepreneurs to follow. This channel is having 550k+ subscribers, and god knows when you will see this post might he have crossed the 1 million milestones. R.Blake is a creative entrepreneur, speaker and book author. His basic mission is to educate and motivate the creative persons. The best part of him that he used to upload daily videos and basically helps the creative entrepreneurs in learning of technical skills, thinking, an approach of business and how to deal with customers and clients. This channel provides videos on entrepreneurship, tools, tech, social marketing, content marketing, business development, etc. As a result, having 380k+ subscribers and showing no signals to stop. So, it’s among advisable best youtube channels for entrepreneurs. WORKING FOR YOURSELF; SHOULD YOU BE A SOLO ENTREPRENEUR? This channel is very much precious for anyone who interested in startups. Basically, they used to make short videos regarding startups, startup investors, startup schools, interviews, female founder and startup related talks. Y Combinator company also used to invest in newly startups. Read More: What actually every startups need? This youtube channel is having more than 150k+ subscribers. If you are interested in startups related stuff, you will find it amazing. These videos will add a ton of extra values to yours. 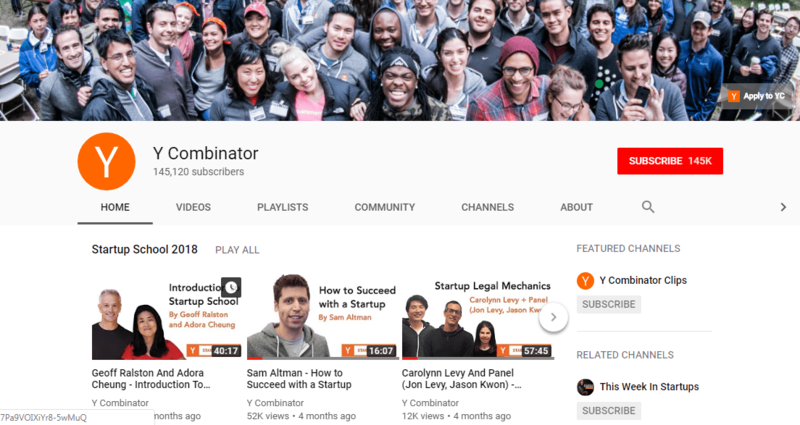 This is among the best youtube channels for entrepreneurs to follow. He is one of the world’s top leadership expert and motivational speaker. Apart from this, he is an author who wrote books like The Monk Who Sold His Ferrari and The 5 AM Club and some other books. 15 million books sold in 96+ countries. Many of the big organizations like NASA, Starbucks, Microsoft, IBM, Unilever etc have chosen Robin Sharma as their mentor so that they can reach up to the next level in this world. 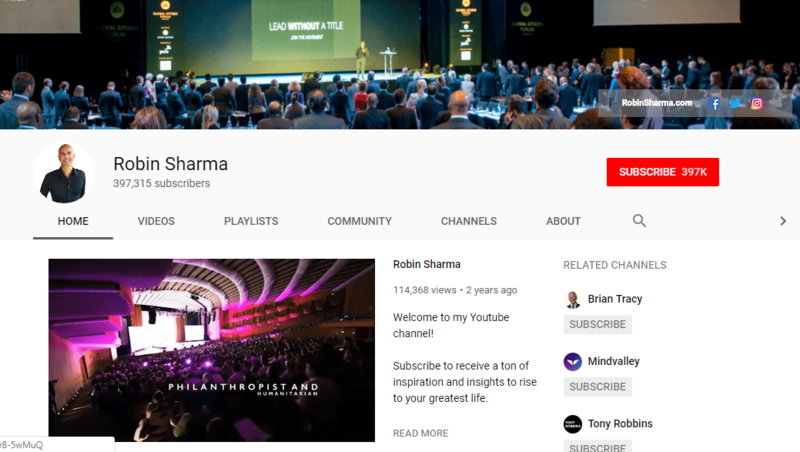 Robin youtube channel is having more than 400k subscribers and still counting. His videos regarding life hacks, business advice are unbeatable. And a great source for providing self-made advice to businesses, and many more of his values we will gain by following him. Noah Kagan is a founder of Sumo (list building tool for website designing), Appsumo, and Kingsumo which helps the entrepreneurs. Even he was an employee at Facebook and Mint. His youtube channel is having currently 45k+ subscribers. In spite of knowledgeable videos, you will get full entertainment. Mostly videos are focused about business advice for entrepreneurs and businesspeople. Subscribe it from here. How Much Money Does an Entrepreneur Make? He is active on the youtube channel from quite some months, you will get to know more about entrepreneurship related idea from here. That’s why his channel is one among the best youtube channels for entrepreneurs. In spite of mentioned above, there are a lot of other people whose content is also quite worthy. And the list prepared here is of my own point of view. Someone may not agree with me completely. That’s why we are also providing some other youtube channel from where anyone can gain knowledge and add it to their small business and startups. Entrepreneur – This basically provides the video on business ideas and trends from the Entrepreneur magazine. Provides expert ideas, growth strategies for small businesses. Inc. – Provides videos over business and management including sales, employee handling, management of staffs, and much more you will find here. Neil Patel – He is one of the best SEO marketing strategists, influencer and web developer. You will find his youtube channel regarding keyword research, how to rank in google etc. Sandeep Maheshwari And Dr Vivek Bindra – (If you are Indian and know the Hindi language) Then you can follow them. Sandeep Maheshwari is an entrepreneur and good motivational speaker and his youtube channel have 9 million subscribers. Similarly, Dr Vivek Bindra is also a motivational speaker along with business trainer and coach. 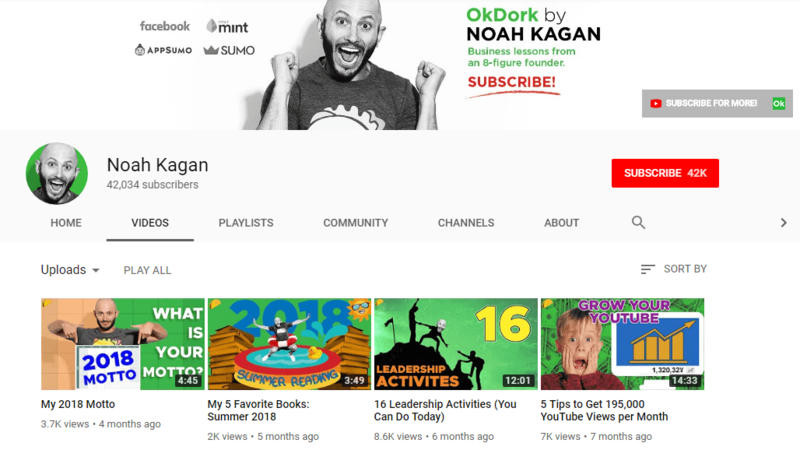 I hope you enjoyed this reading about best youtube channels for entrepreneurs. Each of the mentioned above youtube channels has a unique set of quality made the audience to watch them. 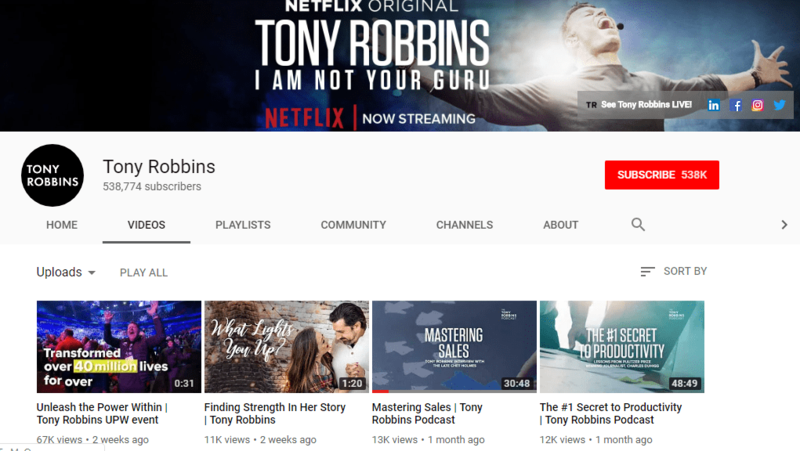 Hoping that these youtube channels will add value to your entrepreneurial life and hope their advice and some life hacks made you bring changes in yours. Keep Learning, Be Motivated. If I missed some best youtube channels then do comment below so that I can update his/her youtube channel here. Thanks buddy for your article. I am following almost all of you mentioned above from 2018 itself. Thanks for letting us know about your engagements.